The WMWG has initiated many forward steps in opening up critical conversations about water issues including the suggestion of House Bill 529, legislation that established a state board to oversee such issues. The Kentucky Water Resources Board (KWRB) is the result of this new law and is administered by the state’s Energy and Environment Cabinet to assist in conducting research and developing recommendations to enhance the quality of water resources accessible for agricultural production in the state. The creation of this Board not only represents a more permanent group put in place to help manage these water resources, but also is indicative of KFB’s stance in looking to the future needs of its members and all citizens of the Commonwealth, said Steve Coleman, WMWG Chair. “To put it simply, none of us can survive without a safe, plentiful water supply. In looking forward at possible solutions to water issues that could arise, we stand a much better chance of handling situations such as drought conditions than trying to react once they have occurred,” he said. Coleman also said there never needs to be a situation where agriculture is pitted against its urban neighbors over water. “Working well together is the best possible situation we can be in if and when the need arises to take action over water issues,” he said. Kevin Jefferies, Vice-President of Oldham County Farm and a member of the WMWG will also serve as one of the new KWRB members. He said in a year that has seen its share of rain, dry conditions may be the last thing on most people’s mind, but that could change quickly. “In the years I have been involved in agriculture, I have often seen many growing seasons turn from wet to dry in a hurry, so being prepared is the best thing we can do for agriculture and all parties with a vested interest in water issues,” he said. Coleman emphasized that in addition to the passage of HB 529, efforts made by the WMWG were proving successful in bringing a host of agencies together to examine all issues related to water and in doing so, the group’s work has been recognized in other states. Better water management benefits all businesses, industries and, ultimately, all Kentuckians. The work conducted by the WMWG and now, the Kentucky Water Resources Board, will provide a unique opportunity for Kentucky to demonstrate its willingness to meet such an issue head-on, in a bi-partisan way while setting the bar for other states to work in the same manner. In July of 2016, the first meeting of the newly appointed Board, consisting of 11 members appointed by the governor, convened representing a variety of stakeholders including Kentucky Farm Bureau and the Kentucky Department of Agriculture. 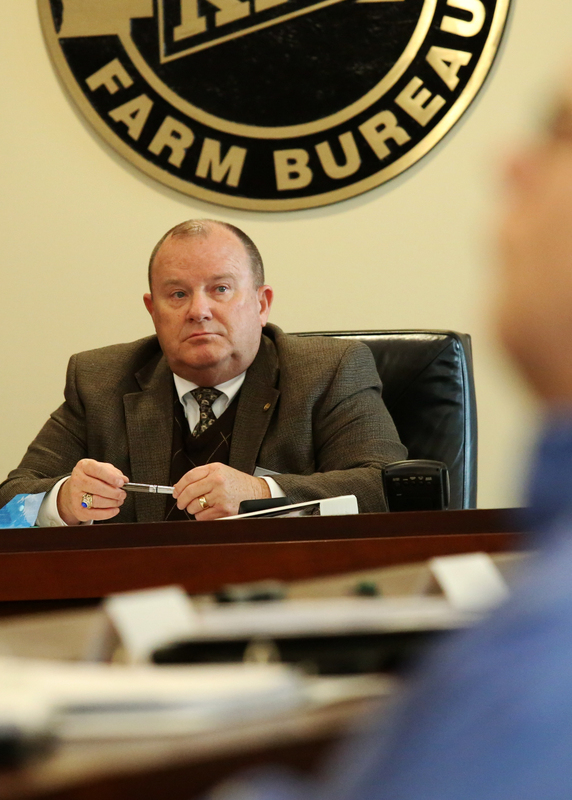 KFB President Mark Haney and Executive Vice-President David Beck attended the meeting. Haney said seeing the work of the board and the many KFB members who showed their support during the passage process of the bill was very gratifying. Beck said the creation of the board is not only good for agriculture but for all Kentuckians. “At the end of the day, better water management would be a benefit to all businesses, all industries and, ultimately, all Kentuckians,” he said.